How long are the classes? The classes are 45 minutes each. How many classes are in each session? Classes are held once a week for 10 weeks for our Fall, Winter, and Spring sessions. We also run a 6-week Summer semester. What does my tuition include? Your tuition includes your 10 classes, a CD with all of the semester's music, a fully-illustrated picture book, and a digital code that allows you to unlock the music in your HELLO EVERYBODY app (available from your app store). In addition, you get a Parent Guide that details all the "WHY"s behind what we do in class and how your child is growing and developing through music. Families with infants in a mixed-age class will also take home a special Guide for Babies in a Mixed-Age Class. Each semester we rotate through one of nine collections of music, so you can take Music Together® for three years and not repeat the same songs! How many children are in a class? Young children participate at their own level in classes with a mix of ages. Class size is a maximum of 12 children. Each registered child is accompanied by a parent or caregiver. What is the age of the children in class? Most classes are mixed-age groups, from babies up to preschoolers (newborn–age 5). The program is family-based so children of different ages can enjoy class together, like siblings. Activities focus on adult/child interaction rather than child/child interaction. The Babies class is for newborns through 8-months. Rhythm Kids classes are for children from 4-years to 7-years-old. What do you do in class? In our Music Together classes, children and the adults who love them meet each week to experience songs, chants, movement activities, and instrumental jam sessions. You’ll find instruments galore, drums of all sorts, bells, triangles, shakers, rhythm sticks, scarves, maracas, and more! 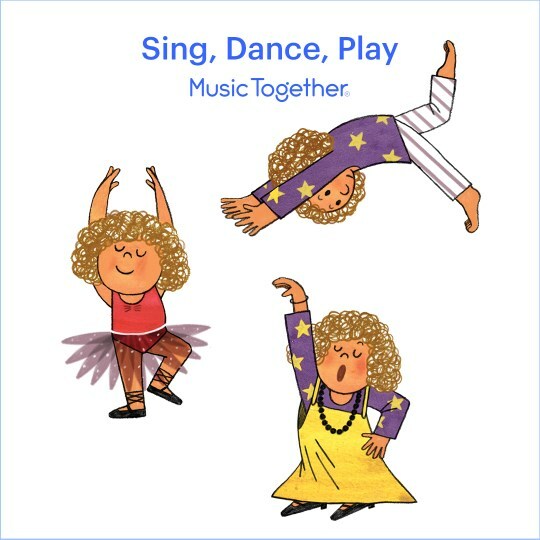 Both adults and children sit in a circle, dance, sing, and have fun! What if my child won’t sit for the whole class? Music Together classes maintain a non-formal atmosphere. We don’t expect the children to sit for the whole class, and we don’t sit for 45 minutes either. We trust and respect each child’s unique learning style. Some will simply stare and study the experience; others wander around the room exploring the space and checking in visually with the adult who brought them. Then there are those who sing and dance freely. They display what they have learned where and when they feel comfortable, usually at home or in the car, etc. As they become more familiar with the music, parents may observe more musical behaviors from their children. However, this is a non-performance oriented program emphasizing the creative and fun process. You are your child’s most important music model. So just relax and try to find your own joy in the music. If you are enjoying yourself, you child will see and sense that, and will want to share that enjoyment with you. How can I be the music model for my child, when I’m not musical at all? Parents/Caregivers, regardless of their own musical ability, contribute greatly to the enrichment of the child’s musical experiences. Whatever the level of your technical skill, remember, the most important things you can model for your child are simply authentic pleasure, interest, and the desire to participate in music activities.